Francis, a twenty-three year old man dealing with his own overwhelming fears brought on by Obsessive Compulsive Disorder, happens to be humanity’s next best chance at establishing life on Earth once more. Traveling aboard the Sagan, Francis faces all the struggles of a man coping with life in space and the anxiety of having one of his own forgetful moments bring about the destruction of the entire vessel and all who inhabit it. As a professor and trusted expert, it is Francis to whom the rest of the crew turn to as they make plans to return to Earth. Forced to break out of his comfort zone and abandon the safety of his classic literature, Francis obliges and proceeds to help save life as it was once known. Professor Francis Burns, the main character in Neil O’Donnell’s Return of the Sagan, is one of the richest and most well-drawn characters I have encountered in a book in the science fiction genre. He is endearing from his first appearance and continues throughout the book to be relatable on a level most characters never reach. Francis’s battle with OCD is just one of the many aspects that keeps him down-to-earth. His constant references to Tolkien and the effortless way with which he quotes lines from Tolkien’s novels make him a less intimidating personality among the other characters. O’Donnell’s desire to pepper his text with pop culture references adds to the book’s overall appeal. I am not a science fiction fan, but familiar names, books, movies, and song titles pull me in and give me more of a reason to continue reading when the more technical lingo tends to have the opposite effect. The author places these pop culture hooks in the perfect spots throughout the reading. The unique blend of science fiction and fantasy emphasized by Francis’s extensive knowledge of literature and history is quite amazing to behold. The repopulation of some of the world’s most endangered animals was beautiful to visualize. However, the reappearance of extinct species–and aggressive predators, at that–was simply breathtaking. I hesitate to compare it in any way to Jurassic Park, but in some small ways, O’Donnell’s story bears a resemblance to the original movie’s plot. I have to admit, I saw the plot going in a much different direction once the crew reached Earth. I won’t say I am disappointed, but I will say, without giving away the ending, that I looked for a resolution that never arrived. O’Donnell has left me to reach some of my own conclusions–and that, I appreciate. Whereas, some readers prefer to have the story wrapped up in a nice little package by the concluding lines, I prefer an author leave me with the desire to reread for clues and leave the book open for a sequel. O’Donnell definitely inspires as many questions about the fate of Earth’s human population as he does answers about the resurgence of plant and animal life. 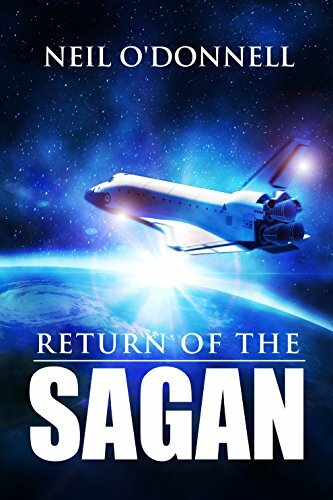 I give Return of the Sagan 5 out of 5 stars. With a relatable main character and a plot filled with action from the opening chapter, O’Donnell has provided readers with a hit. Science fiction fans who seek memorable characters will not be disappointed with Professor Francis Burns, his extensive knowledge base, and his undying love for J.R.R. Tolkien.